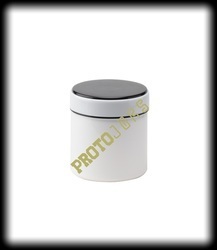 We offer a wide range of high-quality Double Wall Cream Jar to our valuable customers. These jars are widely used for filling of fairness cream suitable for men. These jars can be availed from us at a very reasonable market price. These jars are available with screw caps that are easy to use and keep the creams free from contamination. These jars are manufactured using latest technology machinery and under the supervision of highly qualified professional. Looking for Double Wall Cream Jars ?